How you grocery shop is KEY. I pretty much have my little lazy girl grocery shopping down to a tee. Lazy girl meal prepping means ZERO cooking involved. Cooking takes way too much time if you are anything like me. Food is important! Similar to how we put gas in our cars in order for them to run, we have to also fuel ourselves to be able to have energy for everything we have to do during the day. Keep in mind, what I pack for myself works for me. I do not recommend eating what I eat because I’m not certified to give you a specific meal plan & how, what and when you eat depends on how active you are, gender, height, weight, and what you are comfortable with. There are many factors to take into consideration when figuring out how much food you need & what foods are going to work for you & your lifestyle. Please do, however, take some ideas from me & read this post on how to find the perfect amount of food to eat for yourself! As a girl-on-the-go, I like to make things EASY. I like simple, 5 minute type of meal prep. The longest and most time-consuming part of my meal prep is going to be grocery shopping. 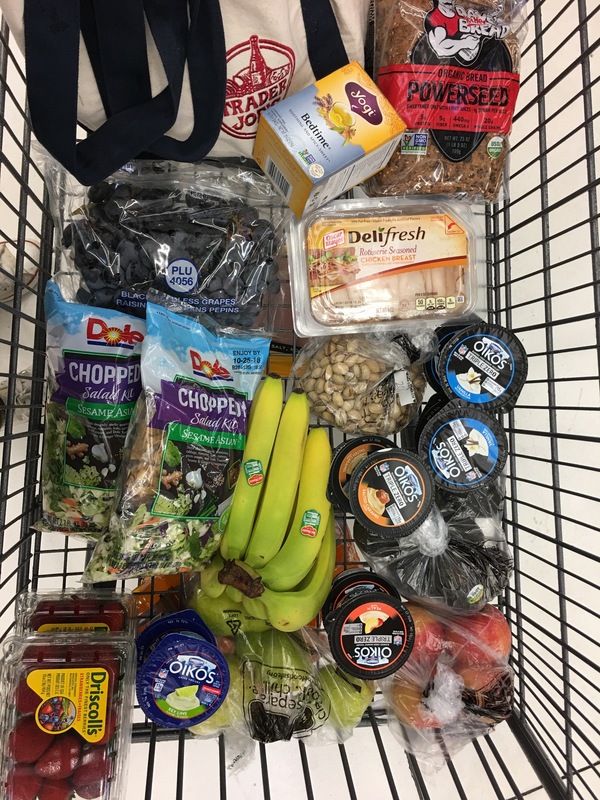 If you are on a budget like myself Win Co is an awesome place to get the basics for your week. Fruit! I basically pick the cheapest/freshest fruit for whatever season we are in. Currently: strawberries, black grapes, pears, banana, apples. NUTS. I love Win Co’s trail mix medley they have going on, they have such variety. I look for ones with the least salt, no chocolate and lots of flax & pumpkin seed! A pound of pistachios is also necessary of course. & That’s all I get for lunchies from WinCo. I’ll also stop by Trader Joes every couple of weeks and grab some more fruit, coconut milk, spices, bagels, any other random thing I can’t resisting grabbing. Last week I bought Gluten free pumpkin spice pancake mix (like why? ), Anyone else guilty of buying random stuff at Trader Joes? First things first, get out your Tupperware and make a salad. Bringing a salad on the go and eating one every single day will save your life. It’s such an easy way to get your veggies in. 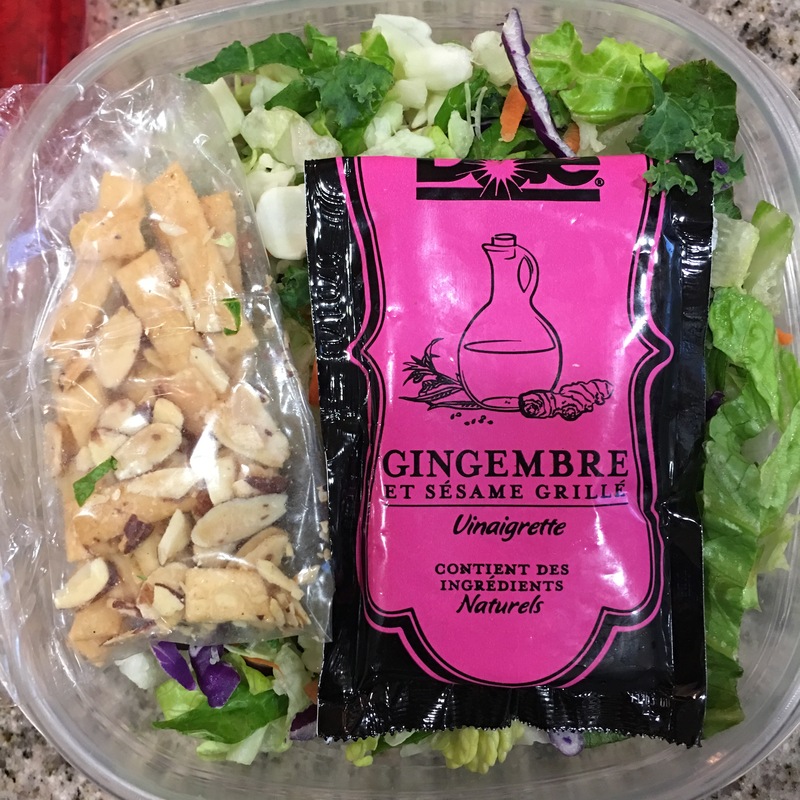 I found a salad that is super tasty, affordable, and sooooo easy to take with me. 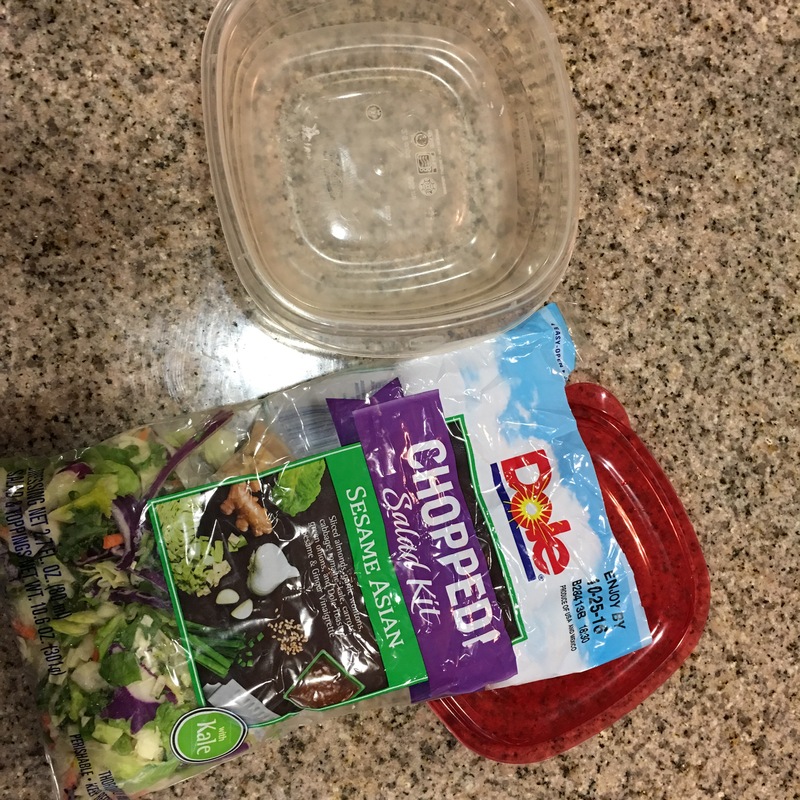 DOLE CHOPPED SALAD KIT – Sesame Asian is my FAVE. I pack this baby nice & tight in a Tupperware & I am done with my salad. Next I will be sure I have FRUIT. Fruit is so filling, full of carbs and sugar – PERFECT for fueling you with some serious energy. I like to pack a banana and either an apple or pear. I pack a small bag of carrots to get some more veggies in. A protein bar is PERFECT also! Make sure you check the ingredients before putting it into your mouth. Protein bars are good to have “just in case”. Sometimes I will randomly be really hungry in the afternoon or stuck in traffic on the way home, you just never know when you need a protein bar. 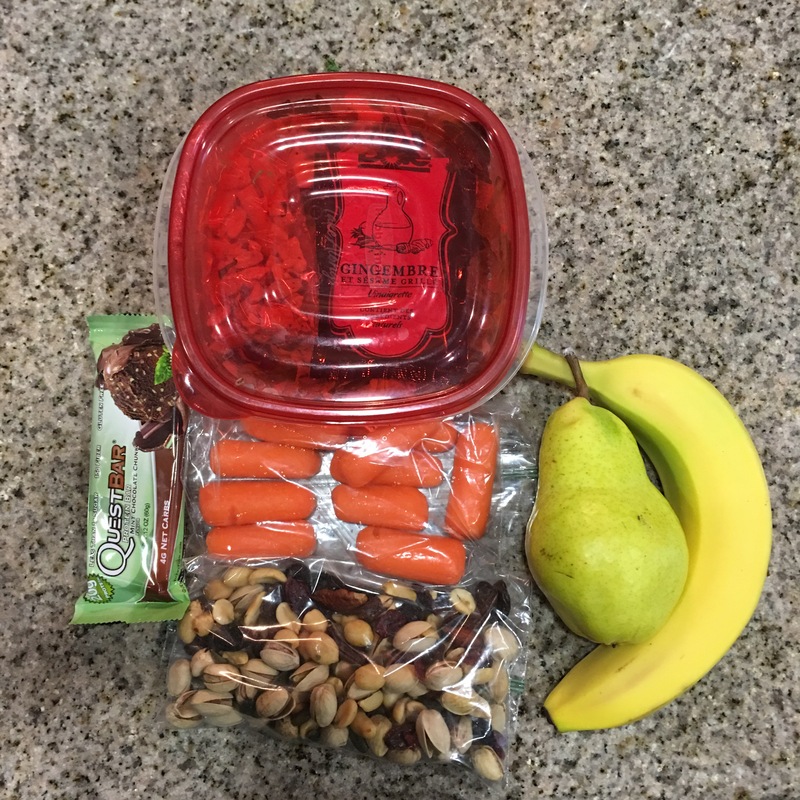 I pack a little more than a cup of nuts with me which fills me up for at least an hour & a half but pair it with some fruit and you will be full for hours. Now I know a lot of you probably follow some major instagram famous fitness models that pack ground turkey or chicken, veggies, and potatoes every day for every meal but what works for them & their lifestyle most likely wont work for you. I found out that eating meat with every meal is not what I need with my lifestyle, I also found out many other interesting facts about myself by calculating my macro’s. Read my post on Macros to learn more on how you can find out how much and what foods you need to eat, I highly recommend this in order to really understand yourself and crush your fitness goals!